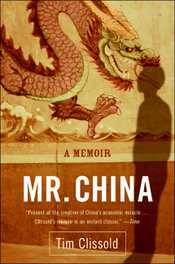 Over the course of the summer several people have asked me if I have read the book Mr. China, and even though I say I haven't read the book, they invariably assail me with a flurry of questions. Essentially, it seems people want to be assured that what happened to the author of Mr. China, Tim Clissod, will not happen to them. I finally got my hands on a copy of the book (coming across English language books in Shanghai is not as easy one might think), and I can finally answer some of those questions. What happened to Clissod and his associates is often dismissed as not being possible today because people can avoid joint ventures in China by setting up a wholly foreign owned entity (WFOE). However, people still do joint ventures in China and sometimes it is more advantageous or even necessary to do a joint venture. No one can guarantee that what happened to Clissod will not happen again and, consequently, anyone considering investing in China should read this book. The book is basically the story of how Clissod and his associates learned that they can't come to China and expect to do business the way they did business in the West. The book has been summarized time and again in various book reviews as the tale of how a big time Wall Street investment banker and a Chinese speaking Englishman lost nearly half a billion dollars investing in China. The author of the book summarized the period of investment in China during the nineties as "the Vietnam war of American business." Fighting in a foreign land against an enemy that can't be identified until he's taken a shot at you is pretty similar to doing business in a foreign land with a thief you can't identify until he's already taken your money. The lesson of the book is in the "foreign land" aspect of the metaphor. The author makes several references to Sun Tzu's book, The Art of War, and two of Sun Tzu's teachings are to avoid conflict on foreign soil and always, always know your enemy. Mr. China is a parable about the consequences of doing business on foreign soil and failing to understand Chinese culture.